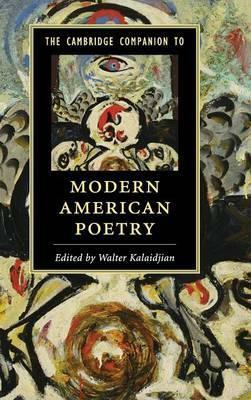 The Cambridge Companion to Modern American Poetry comprises original essays by eighteen distinguished scholars. It offers a critical overview of major and emerging American poets of the twentieth century, in addition to critical accounts of the representative schools, movements, regional settings, archival resources, and critical reception that define modern American poetry. The Companion stretches the narrow term of 'literary modernism' - which encompasses works published from approximately 1890 to 1945 - to include a more capacious and usable account of American poetry's evolution from the twentieth century to the present. The essays collected here seek to account for modern American verse against the contexts of broad political, social, and cultural fields and forces. This volume gathers together major voices that represent the best in contemporary critical approaches and methods. 1. The emergence of 'the new poetry' John Timberman Newcomb; 2. Modern American archives and scrapbook modernism Bartholomew Brinkman; 3. Experimental modernism Alan Golding; 4. The legacy of New York Cary Nelson; 5. The modern American long poem Anne Day Dewey; 6. Objectivist poetry and poetics Rachel Blau DuPlessis; 7. American poetry and the popular front Alan Wald; 8. Tracking the fugitive poets Kieran Quinlan; 9. Midcentury modernism Stephen Burt; 10. American confessional verse Michael Thurston; 11. Black mountain poetry Kaplan Harris; 12. Beat poetry and the San Francisco renaissance Maria Damon; 13. The black arts movement and black aesthetics Evie Shockley; 14. New York School and American surrealist poetics Edward J. Brunner; 15. Land, place, and nation: toward an indigenous American poetics Janet McAdams; 16. Transpacific and Asian American counterpoetics Yunte Huang; 17. Language poetry Barrett Watten; 18. Poet-critics and bureaucratic administration Evan Kindley. Walter Kalaidjian is Professor and Chair of the Department of English at Emory University. He is the author of The Edge of Modernism: American Poetry and the Traumatic Past and editor of The Cambridge Companion to American Modernism (Cambridge, 2005).